If you can’t analyse what you’re doing, then you can’t see how effective it is. If you can’t tell how effective it is, then you could be wasting time, money, and effort on actions that aren’t improving patient care or your practice. The effective use of data is changing the face of healthcare and the way we do things, and the same goes for technology. Last chance to register for the "Data, Technology and Viability" event to gain actionable insights on how to improve the patient and doctor experience, build sustainability and viability into your practice and utilise technology to drive outcomes and increase efficiency. what consumers are saying about healthcare so we can close the awareness gap between the services offered and the awareness/expectation of patients and seek better patient outcomes and new opportunities. how the primary care data connects with other health providers, so we can provide integrated care to patients that best meets their clinical needs. how to use technology to solve problems in new cost-effective and time-efficient ways. Practice principals who would like to understand industry performance and technological progress and develop a strategic planning pathway to a long-term sustainable and productive practice. General practitioners and GP registrars who wish to keep pace with evolving patient needs, proactively respond to emerging trends and deliver the best possible patient care. Any doctors (and future doctors) who like to explore how to better integrate data and technology in healthcare provision, understand the overarching patient journey though health systems and become better clinicians in the future. The changing face of general practice and patients' needs and how we can put data to work for us in practise. Prof Jennifer Reath – Department of General Practice, Western Sydney University. 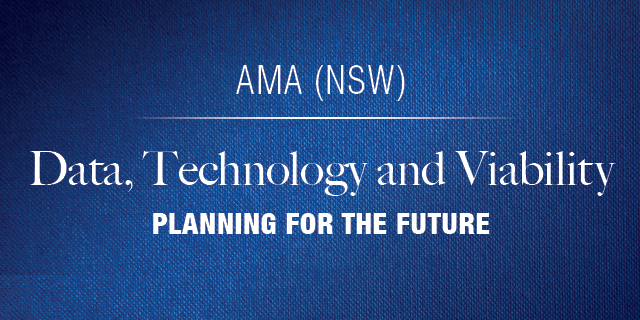 Dr Kean-Seng Lim – AMA (NSW) President and Councillor. Dr Lim is a GP Principal in a group practice in Mt Druitt and a GP Supervisor. Data linkage - using data from general practice and hospitals to highlight patient journeys and how systems work together. Dr Jaspreet Saini – Clinical Director, Western Sydney PHN. Dr Saini is a GP practicing in western Sydney, Australia. Health consumer survey data and data insights - informing us about the patient perspective. Mr Alexander Rannaleet – National Director I Health I Commonwealth Bank. Adapt to digital transformation and use technology to increase efficiency. Data and Technology Driven Healthcare is not the future, it is happening now and is an essential tool in a contested environment.